The third and final developer diary for A Plague Tale: Innocence is here, and it's all about the rats. The packs of plague-carrying rodents are a core part of the game, but developer Asobo Studio says they weren't part of the plan when the project got started. Now, though, the game is capable of showing 5,000 of the things simultaneously, all governed by a combination of individual and hive mind AI to make them move together naturally. It's pretty impressive, and reminds us somewhat of Days Gone and its large hordes of Freakers. 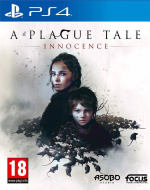 A Plague Tale: Innocence comes to PS4 on 14th May 2019. Are you looking forward to this dark adventure? Keep the lights on in the comments below. The more I see of this game the more excited I am for it. It looks great both graphically and gameplay wise, I’m sure the story will be really good too, can’t wait for it. I think this looks unique so really a stoked for it. The more I see of this the higher it is climbing on my list of games to pick up.